Idea for a T and JK Racing Game and...Hello, all. 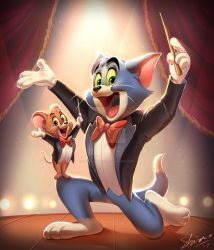 for those of You that enjoy Tom and Jerry's Escapades as Children, How does everyone feel about a Video Game Idea, Starring Little Tom and Little Jerry? Tom's Neighborhood A Quiet Suburb-Themed Racing Circuit. Frozen Forest A Frozen Circuit with Trees that look like Ice Sculptures. Gravity Garden a Wacky Biosphere-Based Circuit with the Garden Plants upside-down. Palmtree Paradise an Island with a Dormant Volcano, in the Track. Ooh. Ending Ideas for All-New Tom and Jerry KidsHello. I haven't added a Journal for 1 and a half Months, So, I thought... Endings mostly seen in Anime, like the Characters doing something as the Credits roll.